For those in the know, it isn't news that Portland Oregon's visual art scene has experienced a massive influx of artists (over 10,000 according to the last census) that has subsequently redefined the sophistication of this city of now 2.1 million metro inhabitants. This trend has only intensified and has been reported on by CNN, Art News and Modern Painters (by yours truly). What is so special about Portland is that unlike other major US cities visual art is the big game in town. Many artists have developed in noteworthy ways in the last five years. For context, Portland is a place where mass transit is popular, trees are big, volcanoes blow up, reading is relentless, shorts are nearly always ok, gallery hopping can be blood sport and civic issues like urban development are debated with a ferocity that might seem alien to other ennui drenched places. The art reflects this dynamicism that has been lost in many modern cities. In 2001 Peter Schjeldahl somewhat accurately called Portland "Sweden with SUV's" and once George Bush (the elder) much less accurately called it "Little Beirut." In other words like all interesting places it is hard to define and Portland artists are probably making those definitions even more difficult. With that in mind PORT is here to give a forum for the visual art shows, events and critical discussions that are taking place in this most European (yet pioneering) of US cities. PORT will also discuss shows and happenings elsewhere of interest. October 1 The Portland Art Museum opens its massive new wing, the Center for Modern and Contemporary Art. 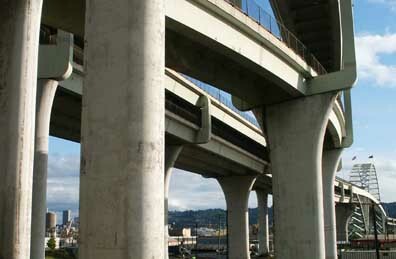 Spring 2006 AGPS architecture will unveil its one-of-a-kind urban aerial tram for Oregon Health and Sciences University. This is so great! What a wonderful concept and great public service to the arts community in Portland! and i'd be lying if i didn't admit that my only reservation about this site is how much of a leading editorial role Jeff Jahn may play in its development. I understand,respect, appreciate his polarizing drive and tireless ability to partially connect the seemingly fractured PDX scene, but his critical vision is singular in aesthetic- limited in taste- nepotistic in scope and utilizes a flagrant hyperbole which unfortunately translates to some as "visionary"" or "well informed ". So, PORT, your challenge is to keep the king of exaggeration ( PDX's art scene is not comparable to the Seattle music scene of the early 90's...that's ridiculous)on a leash, so to speak. And to look at work being made by artists other than Ehlis, Cramer and Bocci. There are atleast a dozen artists that make exceptionally strong, rigorously crafted , conceptually challenging works that have not received the attention they deseve. Like: King's socio- political didacticisms, lush with paint and full of life; Lilly's anit-establishment street pieces and masterful intaglios., to name a couple. So, cheers and best of luck. You can expect my comments on here every once in a while. Yes moustache I'm controversial but I believe you miss the point (although it is an anecdotal reference to the strategy's success). Everyone has an opinion and as you might have noticed we have a variety of views on PORT. Jenn and I purposefully brought a plurality of voices onboard this site. For instance, if we weren't adults Jenn and I might scream at eachother over the merits of some form of art, but we seldom do because it is expected to disagree over simple points of taste. Also, Andie and Jenn prefer figurative work and although I generally prefer abstraction, my favorite painting is either a Caravaggio or a Rembrandt. As far as tone goes, Katherine often writes in a dry European style, and I often write polemically in a way the British seem to prefer. Fact is there is no single editor or voice of this site. So do you feel that the ORGAN(RIP?) had no bias or opinion? Of course they had one. The simple fact that I have strong, definable views in your narrow universe may be intolerable but I welcome anyone with a strong opinion including your own. Portland simply isn't as it was in 1993 and what you see here will only be a fraction of what is going on, and it just so happens that the people you mentioned are some of the most active artists in Portland. What I can tell you is that international curators are starting to make studio visits and a fresh boatload of new art graduates just decamped in this already crowded scene. Portland is a little out of the way yet bustling with activity and that is why the old Seattle reference works. Portland isn't easy to define but an opinion is a way of testing assumptions and experiences. I test mine, you test yours...my track record has been pretty good. Hi Mustache. I'm glad you like our site. I think you will find that the four of us have distinctive artistic leanings. Jeff will have a prominent voice on the site but the rest of us can hold our own, too. We're just as likely to agree as disagree on artists and artistic styles. And, with almost daily posts, you can expect that we'll be covering quite a few. I look forward to hearing you chime in. Sure, i think that The Organ was biased ; any smart publication will turn itself into a focused institute of opinion.That's its manifest destiny. To remain objective would be a joke and would do nothing to further what is so sorely missing from so many allegedly critical publications : something other than expository writing. And, no i haven't missed the point that PORT's material has 4 distinct voices with 4 distinct and disagreeing opinions. That's great. A relief. Can't wait. And, i do think that Bocci and Ehlis are fine artists...Cramer, that's another matter.. Don't mistake productivity and attention for quality and longevity. Hey Custer, you want a haircut?? If Portland circa 2005 is indeed comparable to grunge 90s Seattle, the Sheriff is a modern day Sir Mix-A-Lot on the scene. And Courtney Love wants to put a shotgun down his mouth. Or show him her boobies, I don't know which. I'd shy away from that... because I'm shy! Also, just because you collect my work and want Courtney to blow my head off so you can cash in doesnt mean I intended it that way. It is true meantioning "Grunge" makes some longtime Northwest people crazy though. All I intended was to indicate that Portland is an out of the way place experiencing a critical mass of artists are congregating mostly for the sake of meeting like minded sorts. Nobody in Seatlle said, lets create a music scene... it blossomed from a groundwork that had roots that went back 30 years. It is a comparison, not a parallel. I've compared it to Weimar as well... the comparisons work but only to a point. Who knows what will happen? But it has gotten to big for "nothing" to happen. Design-wise, Pdx is an interesting comparison to Sweden. But Portland has this weird veneer that's like no where else. I'm glad you didn't deny the Sir Mix-A-Lot resemblence.